The pattern Weon-Hyo consists of 28 movements and is required for advancement from 6th geup (green belt) to 5th geup (high green belt). This pattern is named for the Buddhist monk Weon-Hyo (617-686 A.D.), who is credited with having completed the introduction of Buddhism to the general population of the kingdom of Silla just prior to his death. Weon-Hyo, born in northern Kyong­sang Province, was said to be wise from birth. As le­gend has it, he was born in a forest in Chestnut Valley under a sal tree. The sal tree is sig­nificant, as refer­ence to it is usual­ly only found in the legends of very revered fig­ures. Weon-Hyo's official name, given to him at birth, was Sol-Se-Dang. He derived the pen name Weon-Hyo, meaning "dawn," from his nickname "Se-Dak," which had the same meaning. He assumed this pen name in later years after he had become more accomplished as a Buddhist philosopher and poet. In the past, Koreans were identified by many names; each person had a nickname as well as an official name. A person of intellectual or artistic talents might also be given a pen name, and monks and apprentices were often given yet another name by their masters. Weon-Hyo started his career at the age of 20 when he decided to enter the Buddhist priesthood and converted his own home into a temple. 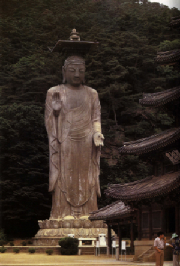 Buddhism, however, was not a popular religion in Silla at that time. Although this religion had been introduced into the kingdom of Goguryo in 372 A.D. and Baekje in 384 A.D., the general population of Silla was reluctant to accept it. The monk A-Tow was supposed to have introduced it to Silla between 417 A.D. and 457 A.D., but the religion was mainly confined to the royal family and rejected by the people. This religious isolation, however, was to change during the 7th century. At that time, Silla was at war with the kingdoms of Baekje and Goguryo. 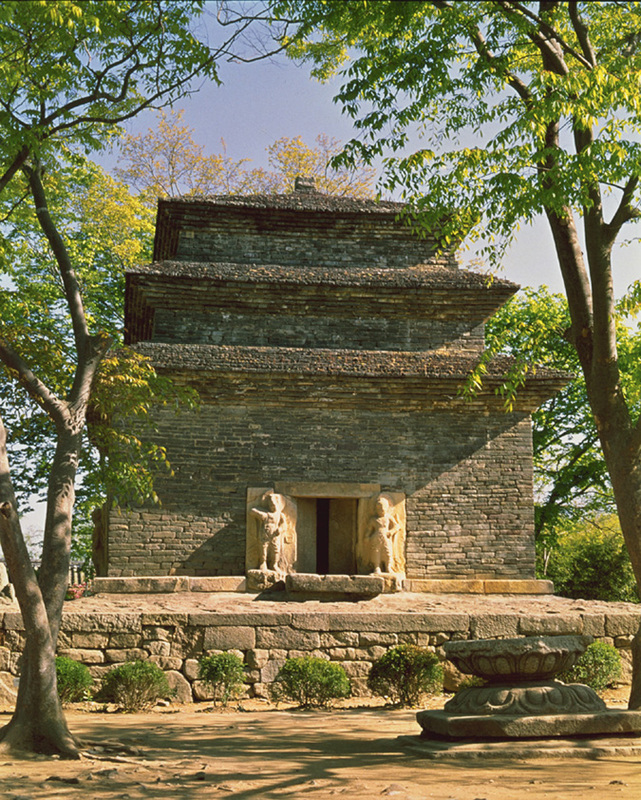 It was under constant invasion from Baekje, and in the year 642 A.D., it lost 40 castles to Baekje attacks, including the great castle of Taeya near the capital of Silla. This atmosphere dramatically influenced the Buddhist faith of all three kingdoms. Religion became more nationalistic, which tended to intensify the ferocity of the conflicts. 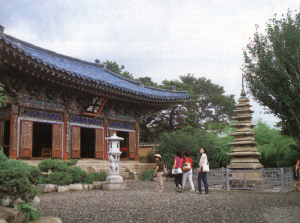 Unfortunately, not many places were open for the ser­ious Buddhist stu­dent to study in Silla. Therefore, Weon-Hyo and the noted monk Ui-Sang, like other monks of the time, set out to study Buddhism in China in 650 A.D. The overland journey took them to Liao­tung in Goguryo. Mistaken as spies along the way by several Goguryo sentries, they barely escaped captivity and were able to return to Silla. There is no further record of Weon-Hyo traveling to China to study although one more attempt was made shortly after Baekje was defeated in 660 A.D. by Silla and Tang troops from China. Such study was not necessary however, because wisdom was Weon-Hyo's from birth and he did not need a teacher. He therefore became the only monk of his time who did not study in China. The many monks who did study in China had a broad impact on the reli­gious culture of the Korean penin­sula. In fact, there were at least five main sects of Bud­dhism being prac­ticed in Silla dur­ing this period: Kyeyul, Yulban, Chinpyo, Popsong, and Hwaom. Chinpyo and Popsong were introduced by Weon-Hyo with Popsong being based on his book, Sipmun Hwajongnon (Treatise on the Harmonious Under­standing of the Ten Doctrines), from which Weon-Hyo's posthumous title of "Hwaong Guksa" was derived. Weon-Hyo was, in fact, the most in­fluential of the many monks of the 7th century. He used his power in an at­tempt to uni­fy the five existing sects and reduce their constant sec­tarian rivalries. He is also consid­ered to be one of the most prolific writ­ers in all of the Buddhist countries of his time. His works include over 100 different kinds of literature consisting of about 240 volumes. Un­fortunately, only 20 works within a total of 25 volumes have survived. One of the forms he chose to use was a special Silla poetic form, Hyangga. These poems were mainly written by monks or members of the Hwarang concerning patriotism, Buddhism, and praise of the illust­rious dead. Weon-Hyo's poem "Hwaomga" is said to be among the most admired of these poems. Weon-Hyo's writing was not the only area in which he gained recognition. He was well known both to the general population and to the members of the royal family and their court. He was often asked to conduct services, recite prayers, and give sermons at the royal court. In 660 A.D., King Mu-Yol became so interested in Weon-Hyo that he asked him to come and live in the royal palace of Yosok. A relationship with the royal princess Kwa developed and was soon followed by their marriage and the birth of their son Sol-Chong. Sol-Chong grew up to become one of the ten Confucian sages of the Silla era. He is recognized for his scholarship in Chinese literature and history, and for his adaptation of Idu, the system of using Chinese characters phonetically to record Korean songs and poems. As Korea had not yet developed an alphabet this adaptation was very important. It made Chinese literature available to the general public by creating, in effect, a method for translation. Sol-Chong is said to have been the author of many original works; however his Kye-Hwa-Wang is his only surviving work. Shortly after his son was born, Weon-Hyo left the palace and began traveling the country. In 661 A.D., he experienced a revelation in his Buddhist philosophy and developed the Chongdo-Gyo (Pure Land) sect. This sect did not require study of the Chinese Buddhist literature for salvation, but merely diligent prayer. His belief was that one could obtain salvation, or enter the "Pure Land," by simply praying. This fundamental change in Buddhist philosophy made religion accessible to the lower classes. It soon became very popular among the entire population. And, in 662 A.D., Weon-Hyo left the priesthood and de­voted the rest of his life to traveling the country teach­ing this new sect to the common people. Weon-Hyo's contri­butions to the cul­ture and national awareness of Silla were instrumental in the unification of the three king­doms of Korea. By 660 A.D., Baekje was defeated by the allied armies of Silla and the Tang Dynasty of China. 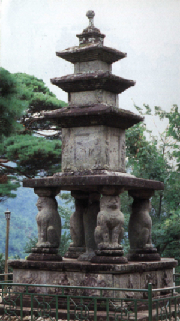 Later, in 668 A.D., the king of Silla, Mun-Mu, was finally successful in defeating the kingdom of Goguryo. This victory was tainted, however, when the Tang troops set their goals on also conquering Silla. But, in 677 A.D., after nine years of resistance, the Tang armies were driven from Korea and the unification of the three Kingdoms of Korea was completed. 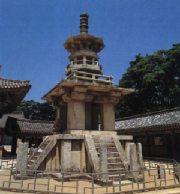 Weon-Hyo died in 686 A.D. and was laid in state by his son Sol-Chong in Punhwangsa temple. He had seen the unification of the Three Kingdoms of Korea in his own lifetime and had helped to bring about a brilliant culture in Korea through his efforts in Buddhist philo­sophy. He had a profound influence on quality of life in Silla and on Bud­dhism in Korea, China, and Japan. The information on the webpage is copyrighted.